Big and burly, a ‘plane with a problem – it’s a Bristol Beaufighter | Shortfinals - aviation and more! All Hallows by the Tower – with an American connection! Big, bold…..and ‘in a bind’. The Fighter Collection’s beautiful Bristol Beaufighter, ‘A19-144’, at the Imperial War Museum, Duxford is one of the most impressive airframes you will see in a British museum. Unfortunately, despite the fact that it belongs to The Fighter Collection who like to fly all their aircraft if possible, the hangar is exactly where it will stay unless a major problem can be solved. Initially, the Beaufighter was used as a radar-equipped nightfighter against the German Luftwaffe during the Blitz of 1940/41, and later by RAF Coastal Command as a long-range day fighter and attack aircraft (it was highly successful against enemy shipping in the English Channel and North Sea, and also against U-Boats surfaced in the Bay of Biscay, and Luftwaffe Ju 88s and other aircraft in the same area). The Australian Department of Aircraft Production (DAP) saw the Beaufighter as a natural follow-on to their existing licence production of the Beaufort. Some 54 Fairey Aviation-built examples were imported to Australia, and some of these Mk 1C aircraft saw action with No. 30 Squadron, RAAF at the Battle of the Bismark Sea. Many equipment changes were made in the Australian-built machines, including a Sperry autopilot under a pronounced hump in the nose and Hercules CVII engines, leading to a designation change to Mk 21. The aircraft you can see above is a composite (almost all existing Beaufighters in various museums around the world are); it is constructed from JM135/JL946, two English-built Mk XIC aircraft, plus parts from an Aussie-built Mk 21 (one wing and other sections) and carries the serial ‘A19-144’. It is finished in the typical, all-over, RAAF Foliage Green, a colour which was found to be very effective camouflage over both jungle and sea. The Fighter Collection (or TFC) performs miracles of restoration work to bring airframes back to life. You can see the detail of the pipework on the front of the wing spar in the above photograph; the rest of the work is to similarly high standards. However, there is a major hitch. 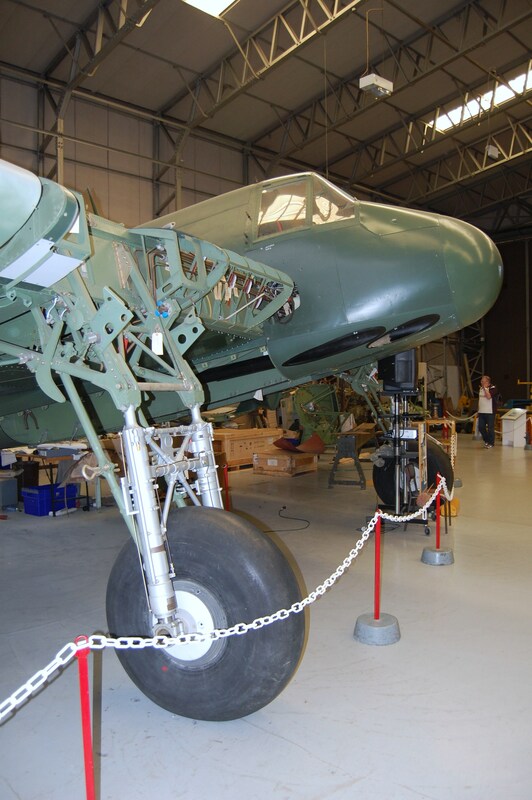 There are currently no flight-worthy Hercules engines suitable for a Beaufighter available. Bristol Hercules engines were extremely powerful and were used in many other WW2 types (Handley-Page Halifax, Short Stirling, Avro Lancaster B.II) and also post-war (Nord Noratlas, Vickers Varsity, Bristol Freighter/Superfreighter). In theory, the spares stocks from these post-war types (the Noratlas transport aircraft was in use with the German Luftwaffe, Greek Air Force and the Israeli Air Force for example) should enable the TFC Beau to take the air. Sadly, these engines are radically different and would require a major re-design of the Beaufighter wing. Unless The Fighter Collection wishes to contemplate a change to Rolls-Royce Merlins (and make a Beaufighter Mk II) there is no ‘quick’ solution. There are rumours that the aircraft might be up for sale. This would be a real shame, for the Beaufighter is one aircraft that many people would wish to see in the air again. Do you perhaps know why there was the asymmetry with regard to the .303 machine guns with 2 in one wing and 4 in the other? The port wing had only two brownings as the landing light occupied the space otherwise allocated to the other two. Would love to see a Beaufighter and Typhoon in the air again. Just a shame that is so unlikely, more so for the Typhoon. The Typhoon is highly unlikely, since the engine (Napier Sabre) is the real problem, there. You COULD produce an airframe that ‘looked’ something like a Typhoon, using modern techniques, but the engine would be the real stumbling block. My money is on a Beaufighter, although a Merlin-powered Mk II would be easier than a Hercules-powered one.